Long before the women’s suffrage movement brought about the ratification of the Nineteenth Amendment in 1920, women were making themselves heard in ways that broadly transformed the American experience, including working for moral reform, abolition, and increased opportunities for education and employment. The Philadelphia region was among the most important centers for these movements. Digitized materials totaling more than 4,000 images are drawn from members’ sites using an interface that allows searching and browsing, and includes letters, diaries, scrapbooks, photographs, work and school records, and organization records. Materials included in the digital collection or collections guide on the site range from papers of such well-known activists as Sarah Mapps Douglass, Lucretia Mott, and M. Carey Thomas, to records and other documents by and about ordinary women — students in schools of medicine and nursing, working-class women, and the subjects of women’s philanthropy. Margaret Graham, managing archivist at the Drexel University College of Medicine Legacy Center and member of the steering committee, observed, “We wanted to encourage users to explore the both the well-known and the lesser-known women and stories, and to seek out unexpected connections across the lines of race and class.” She added that the essays are designed to encourage new researchers, such as high school students, by introducing both the themes and the issues. This pilot project contains only a small sampling of the materials surveyed. “We want researchers to know how much more is still waiting beneath the surface,” commented Sly. The site includes brief descriptions of all surveyed collections, including information on the likely research interests of each. These descriptions appear in the search results; additionally, the site offers a downloadable guide to all the surveyed collections at PACSCL libraries. Sly noted that the project team hopes to build on the work of the pilot project, eventually resulting in the digitization of hundreds of thousands of pages of materials in PACSCL members’ and other regional repositories’ collections. Fundraising efforts for this purpose are ongoing. 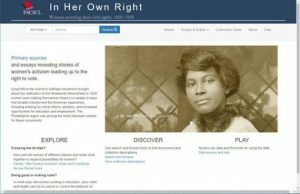 Funding for the “In Her Own Right” project was provided by a Foundations planning grant from the National Endowment for the Humanities. The project steering committee included Margery Sly, Margaret Graham, and Heather Willever-Farr (digital projects manager at the Historical Society of Pennsylvania during the time of the grant). The Historical Society also served as financial agent for the project. Libraries contributing collections to the pilot were the Barbara Bates Center for the Study of the History of Nursing, University of Pennsylvania School of Nursing, Bryn Mawr College, Drexel University College of Medicine Legacy Center, Haverford College, the Historical Society of Pennsylvania, the Library Company of Philadelphia, Swarthmore College’s Friends Historical Library and Peace Collection, and the Temple University Libraries.